The LMC Shear Roll is primarily used to separate almond shells from almond meats. A shearing action is created by operating a 55 durometer rubber roll an adjustable distance from an endless rubber belt at a surface speed differential. The shearing lane is easily adjustable to maximize shelling while minimizing chipping and breaking. The LMC Shear Roll provides a complete separation of the almond meat from the shell. Prior to arriving at the shear roll, the almond shell has already been cracked using a LMC Hard Shell Cracker. The resulting hairline fracture allows the shear roll to separate the almond meat from the shell without damaging the meat in the process. The LMC Shear Roll is the most popular shear roll used in California, which produces the majority of the world’s almond supply. 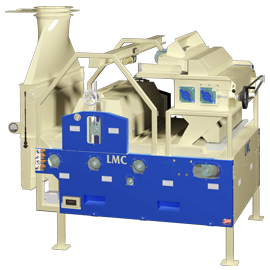 Like all LMC equipment it is designed and manufactured to operate at maximum efficiency with ease of operation and quality sanitation.